The Indian rupee on Wednesday sank to an all-time low of 60.35 against the dollar in mid-session trade, dragged down by heavy end-of-month demand for the US currency. 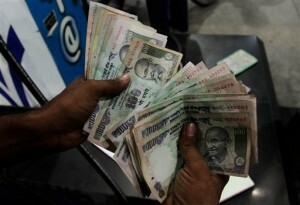 After a lower start, the rupee plunged by 69 paise to 60.35 a dollar at 15:35 hours on the Inter-Bank Foreign Exchange market due to increased buying by banks and oil importers, forex dealers said. Persistent foreign capital outflows from weak local equities also affected the rupee value against the dollar, they said. The Indian currency also remained under pressure following reports of the dollar continuing its upward march against other leading currencies for the sixth straight day. The downward trend was fuelled further by data underscoring the US Federal Reserve’s view of an improving economy and a likely slowdown in monetary stimulus. Treasury managers are expecting the Reserve Bank of India to intervene to stem the rupee’s fall.